A girl I work with made these cute necklaces for all of our co-workers one year for Christmas. This would also be a great craft for kids. 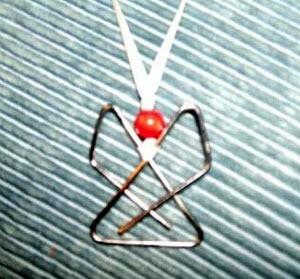 You could even hang one in your car with a note, "Don't drive faster than your guardian angel can fly." Fold ribbon in half. Tie ribbon onto the paper clip using a half hitch by putting the loop end of ribbon through the center of the paper clip, then pull loose ends of ribbon through the loop and tighten. Add the bead onto the loose ends of the ribbon and slide bead down to the knot. Depending on the size of the hole in the bead, you may need to use a craft needle to add the bead onto the ribbon. You may want to add a drop of glue to the bead to keep it from sliding or tie a knot just above the bead. Tie loose ends of ribbon in a knot and trim ends if necessary. Enclose the following poem with the necklace. This is very cute. I wish I could have made this for our Secret Santa Stockings at school everyone would have loved them. I LOVE this idea! Great gift item for the kids to make for Mom, Grandma, and pretty enough to wear with any outfit. Will be using this next year with my Great granddaughter who is 6 and loves making crafts. I made them years ago, try putting a halo form a silver or gold spacer makes a big difference. Good job, I had to make about 50 of them for a party. I just found this website and was delighted to find your angel. I recently started volunteering at the local Senior Center and a bunch of these "angels" were donated by the local Girl Scouts to put into the Meals on Wheels bags for the elderly. I thought they were great...do you have any other ideas for small things like this to go into the bags for each month. I am having a very hard time finding these paper clips. I have even asked our local grocery store to order them but they cannot get them. Any body know where to get them?